The manager seems to have genuine concerns about the fitness of Cesc Fabregas after the midfielder was ruled out for a minimum of two weeks. The captain was substituted immediately after pulling up whilst stretching for the ball in the Braga penalty area on Tuesday night. The Spaniard was a slight doubt for the starting 11 but it seems that everything the medical department said to the manager indicated his captain was fit to play. "And on the other hand if you look at the number of games he played [more than 270 over the course of his career] - he played more the years before last year and the year before." There must be a concern with the number of games Fabregas has had to play this season. Every time he returns from injury he goes straight back into the team. There never appears to be a slow integration back into the side. And that concerns me. Every other player is given time to get themselves match fit but with Fabregas, it's always a case of if he's fit he'll play. I suppose that has something to do with him having the captain's armband and also his desire to play every game. 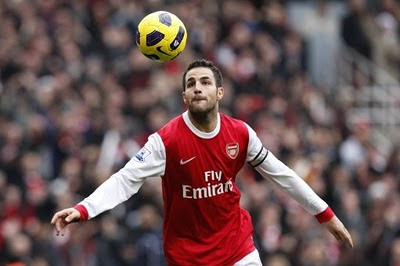 I don't think their is a more committed player than Fabregas in this current Arsenal team. He wants desperately to win. You can see that in his performances. He'll give everything to succeed. But that could also be an area where he needs to be managed more. The manager has to insure that this time when Fabregas returns it's going to be for the long term, not another few weeks. We desperately need him to be fit and ready to play for the second half of the season. We need him to drag us through until the end of May, when hopefully we'll pick up some silverware. It will also be a test on the current team. I believe we lack leaders on the pitch. It is something which becomes obvious to me each time Fabregas doesn't play. There doesn't seem to be a player with the same mentality of the Spaniard. Someone who won't give up, who will chase and harry the opposition until the 96th minute looking for a winner. I really want to see some of these players come of age now in this sense. There too often appears to be a culture of looking around and trying to find a team mate who will step up - leading by example of a match winning performance. I don't care so much about the shouty types. I'm more interested in the performance which will inspire their team mates to give everything for the cause. This is what they look for in Fabregas and now we need three or four of them to do the same. A never say die attitude is a must. Paul Doyle makes a very good argument on the Guardian website that Fabregas should have been left at home on Tuesday night. There is also further reading in The Sun where Steven Howard argues we should use Tony Adams, Steve Bould or Martin Keown in some role at the club. Whilst in the Daily Telegraph, (Spurs fan - I'm guessing) Matthew Norman writes it's time for Arsene Wenger to go. Elsewhere there was the shock announcement yesterday that Aaron Ramey has left the club on loan. He'll play at Championship side Nottingham Forest for just over a month, with his debut pencilled in for Monday night. I'm personally amazed by this development considering the manager said not so long ago that the midfielder would stay at the club during his come back from injury. But we wish the Welshman luck in his spell on loan. Really looking forward to him pulling on the red and white of Arsenal soon.